By this time your social feeds must have been populated by #DearMe tweets, videos and gifs, often carrying wise words of advice. These little #DearMe letters going viral on the social web are part of a YouTube campaign in honour of International Women’s Day on March 8. 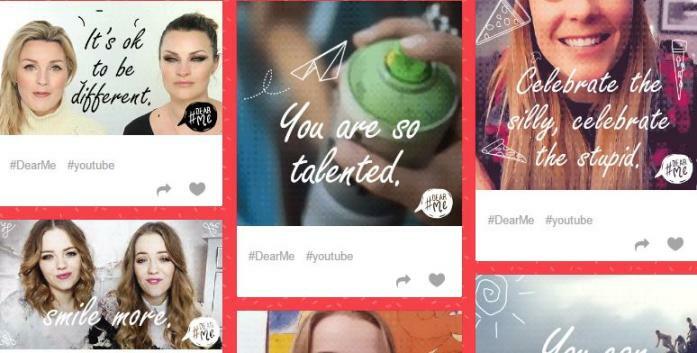 Ushering in a movement for encouraging young girls, YouTube launched the worldwide #DearMe campaign on March 3, 2015, by asking women to upload video letters of advice to their younger self on to the Google-owned video sharing network. With more girls growing up amidst self-doubt, uncertainty and societal pressure, the #DearMe letters can be a helpful friend with answers to their un-askable questions. “YouTube is a place where people can come together, share interests, relate experiences and offer each other support. From #ItGetsBetter to #ProudtoPlay, we’ve seen our community inspire and empower those in need of encouragement,” said Cathy Tang, Marketing Manager for YouTube, in a YouTube blog post. The movement is being spearheaded by women who have carved an identity for themselves with a massive subscriber base on YouTube and they are from all over the globe. YouTube has roped in Laci Green, Grace Helbig, Hannah Hart, Superwoman, Felicia De and more to tell young girls to stop worrying about their body, about who they are and learn to be comfortable with themselves. The campaign has gone viral with worldwide trending of the hashtag #DearMe. The campaign video has garnered over a million views and several playlists on YouTube dedicated to different types. Back home, popular bloggers and vloggers like Malini Agarwal, Scherezade Shroff, Magali Vaz, Vasudha Sharma and many more have also joined the movement, while inviting their followers to join in too. To take part in this movement, one has to upload a video letter to their younger self to YouTube and join the conversation using the hashtag #DearMe. For those of you who cannot create videos, YouTube has also created a Tumblr page that can create gifs in four simple steps. All you have to do is select a background, then a doodle. Write your own message or select from a list of advice like “Confidence is key’, ‘Dump that jerk’, and more. The last step is to share the gif on your social networks. The ‘Gif wall’ features created gifs. The #DearMe hashtag on Twitter is an endless treasure of advice to young girls in the form of tweets, videos, gifs, etc. While YouTube is raking in views on the occasion of International Women’s Day, the campaign is also helping bring about a worldwide social movement in our attitude towards young girls. #DearMe is a win-win campaign for women empowerment!